Celebrations Continue For Zaheer Khan And Sagarika Ghatge - A Grand Reception Hosted At Taj Mumbai! 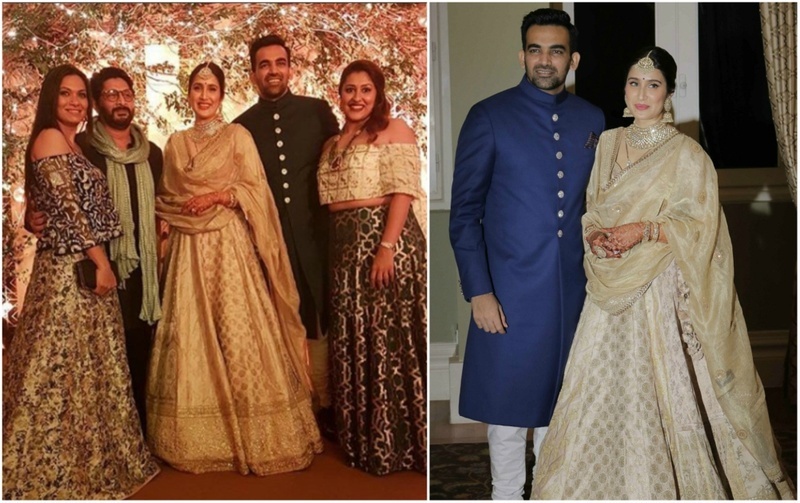 The former Indian cricketer Zaheer Khan and the B-town diva Sagarika Ghatge got hitched in an intimate ceremony last week and the festivities seem to not come to halt. After a post-wedding bash, cocktail party and a lavish Mehendi ceremony, the couple hosted a grand reception on Monday at Taj, Mumbai. A big fat wedding is incomplete without the couple’s ravishing outfits and Zaheer - Sagarika are a fine example of that. The couple has been giving us major fashion goals through all their wedding ceremonies and this star-studded affair was no different. Sagarika wore a resplendent beige and gold Sabyasachi Mukherjee Lehenga with a wrapped around sheer dupatta while Zaheer looked dapper in a royal blue Bandgala.